Snap, Crackle, Pop - Fishy Sounds Deep Under Our Boat! 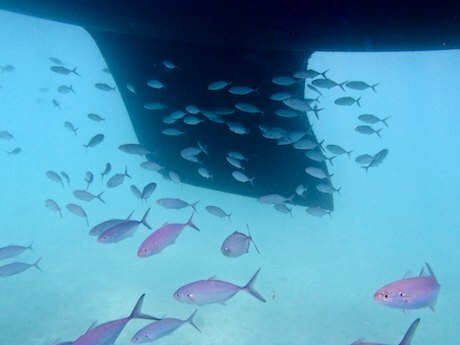 Snap, Crackle, Pop – Fishy Sounds from Deep Under Our Boat! We always have a complete ecosystem living under the boat!! 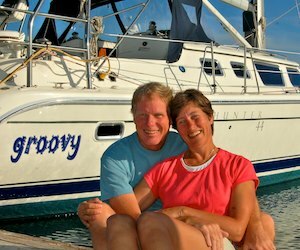 April 17, 2013 – No matter how remote the anchorage, Groovy is never alone in the water. We are always playing host to a whole ecosystem around us! And these creatures aren’t particularly quiet. One of the craziest things about living on a sailboat at anchor is just how noisy it gets at night! We can’t hear the cacophony on deck and don’t notice the noise while we’re watching movies or listening to music. But once the lights are off and we’re lying still in bed, the noise level is astonishing. The most common sound we hear is a crackling noise like bacon sizzling in a frying pan. This popping sound engulfs the whole boat and is often very loud down below. Puzzled by it at first, we had to do quite a bit of research to track it down. We discovered it is made by snapping shrimp (also known as “pistol shrimp”). These tiny little guys live in nooks and crannies on the ocean floor. They are like ordinary shrimp, although quite small, and one of their claws is a very special weapon. This claw can be cocked open and then slammed shut with such force that a huge air bubble shoots out. When this bubble collapses — almost instantaneously — a loud POP is produced. The noise is enough for the shrimp to stun and kill its prey! Here is a wonderful website describing snapping shrimp, as well as a brief and cute YouTube documentary where you can hear the sound snapping shirmp make, and a YouTube explanation of the science and acoustics behind the shrimp’s snap. Snapping shrimp aren’t the only noisemakers, however. Down south in Zihuatanejo‘s nutrient rich waters, Groovy grows a long grass skirt almost overnight, and the ecosystem living under the boat blossoms into an entire city. We often hear the swishing sound of fish attacking the tiny crabs that have taken up residence in the seaweed on the hull, and the fishermen in Zihuatanejo and Huatulco love to cast their nets under our boat in late afternoons and early mornings to catch these fish. On a regular basis we get woken up by the sound of a fishing net hitting the hull! During our six months up north in Ensenada, we heard a completely different and unique sound every night: a honking kind of a noise that made us go up on deck at first to see if it was a fog horn. But all was quiet on deck. The noise was only in the cabin. The honking would go on for about ten minutes, starting far away from the boat and then getting closer and closer, and then drifting away again. We never did figure out what it was, but it seemed to be some kind of fish. He visited us around 9:00 or 10:00 every night for months. We had forgotten all about this noise until we heard it again on the Costalegre recently, some three years later. It had the same pattern, honking at 10 second intervals, growing louder and louder and then fading away. Perhaps the best aquatic noise of the night we’ve ever heard, though, was when we were anchored in Puerto Marques outside Acapulco. Lying in bed the night before we left, we both bolted upright when we heard the strangest, eeriest, squeakiest kind of wailing noise. What the heck? We dashed up on deck to see what it was, but could hear nothing out there. Returning to the cabin, we heard it again, plain as day: a kind of haunting singing. Suddenly we both knew: it was whales! We climbed back in bed, and listened for hours, eventually falling asleep to the mysterious songs of these magical creatures. A few of them must have swum into our little bay. When we awoke in the morning the sounds were gone. Last spring, when we returned to our trailer and first set up camp in the northern Arizona woods, we were really startled by the deafening silence and our utterly stationary bed. There were no popping noises of snapping shrimp, or swishes of fish gobbling crabs from the hull, no singing whales or creaking bulkheads. All was still and silent. This entry was posted in Our travels in brief - Snapshots! and tagged Cruising Lifestyle, Cruising Lifestyle Funny Stories, New, Our travels in brief - Snapshots! by Roads Less Traveled. Bookmark the permalink.